Dr. Ammar Hassan expansively touches all aspects of amyloidosis at sqadia.com. Starting off with properties of amyloid, formation and classification of amyloid also comes under debate. Then histology of amyloid and diagnosis of amyloid through various diagnostic approaches such as SAP scanning and laser micro-dissection system are also discussed. Lastly, management of amyloidosis is pursued. Amyloid is an abnormal deposit of insoluble polymeric protein fibrils in tissues and organ. Physical nature of amyloid is elaborated diagrammatically. Chemical nature of amyloid illustrates that amyloid P component (5%) consists of stacks of doughnut-shaped proteins and a glycosoamynoglycan gives positive reaction with iodine. Initially, Dr. Ammar Hassan talks about pathogenesis of amyloidosis and explains the mechanism of normal proteins when produced in abnormal numbers and production of normal amounts of mutant proteins. Then light is shed on formation of amyloid. 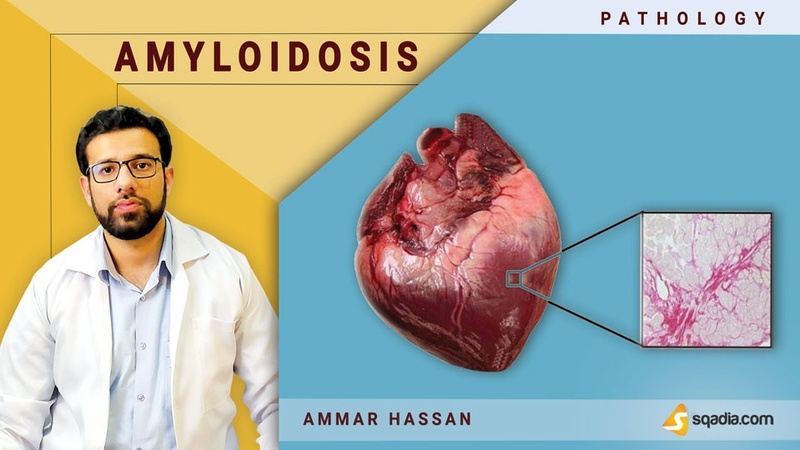 Subsequently, classification of amyloidosis on the basis of generalised/systemic amyloidosis and localised amyloidosis is given. This section is about amyloid histology. At first, staining characteristics of amyloid are highlighted. With haematoxylin and eosin stains, histologic sections of amyloid appear as amorphous and eosinophilic. 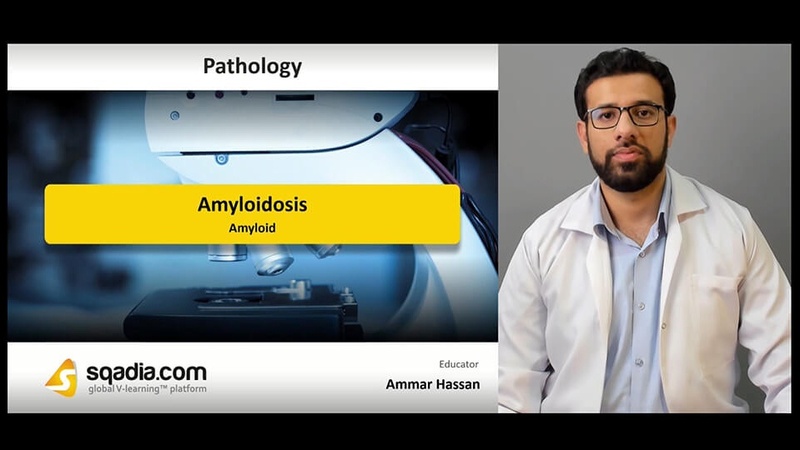 Appearance of amyloid with congo red stain is also elaborated by Dr. Ammar Hassan. Diagnosis is carried out on the basis of presence of amyloid, type of amyloid, and mutation type. Following this, indications for test are reported. Along with chemical testing, imaging techniques such as technetium scan and SAP scanning is also pursued. Organ biopsy and laser micro-dissection system is also considered. This section is initiated by comprehensively elaborating the approach to patient with the help of flowchart. Following this, prognosis is pursued. Dr. Ammar Hassan tells that prognosis with generalized amyloidosis is poor while AL amyloidosis have a median survival.